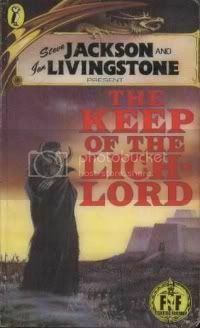 The Keep of the Lich-Lord is by far and away the easiest FF gamebook to date, surely. It doesn't sound that way from the synopsis though - a decades-dead evil guy has come back to life because some Indiana Jones-wannabe removed the magic spear, the one that was keeping him dead, from his chest, and now he's built an army of the undead and is generally causing trouble. You on the other hand, are in it for the money, which is rarely a good enough reason to err, save the world - even Han Solo had to eventually admit he cared. The bad guy is Lord Mortis, and even after finishing the book I still have no idea what a 'lich' is. Some kind of Mason Viking, based on the illustrations and very Stonecutters-esque scene I stumbled on in his keep. Differences the book tries, and largely fails, to implement are two scores - resolve, which measures how large your testicles are in the face of zombies, and alarm, which measures how clumsily you wield those balls. I say fail, 'cause the resolve score goes up every time you successfully test it, meaning eventually it's impossible to fail; and lets just say I managed to get to the lord of the lichs himself without a single person realising I'd even infiltrated his building. No one that stayed alive, of course. His jester doesn't count. So on arrival in Siltport, a formerly bustling town feeling the effects of the credit crunch, I immediately hit the local bar, Sword of the Samurai. Wait, what? Having a little chuckle at the club Obi Wan-style joke, I chatted to some of the locals, and before you know it we were slammed. Fortunately for me, this is one of them gamebooks where nothing the night before affects you the next day, cause it wouldn't be the last time on my journey across Stayng Island I'd make a night of it. Wandered to the vilage of Menela, and was immediately taken to the 'headman', Belar. He tells me there's some creature causing a bit of trouble locally, so I agree for the hefty sum (by FF standards) to kill it. Even better, the local blacksmith sharpens my sword for me, giving it three stamina damage instead of two in fights. To think, I'm on a mission to save the world, and they sent me to do it with a blunt weapon. Anyway, I kill it, and head up the hills to Mortis' tomb. The skull on the door to the tomb glows, but it doesn't scare me, presumably 'cause as a kid my mum once put this glow-in-the-dark Jesus in my bedroom, and when she turned the light off it was the only thing I could see, and it freaked me out. I must've had a strong resolve score as a kid not to fall for that garbage early on. Anyway, I wander into Mortis' tomb and pinch the magic spear from the aforementioned Indiana Jones-wannabe, which happens to do double damage to all undead creatures! Sweet, 'cause almost everything in this book is undead. Often I'll walk into a room and there'll be an awkward moment while everyone tries to work out if I'm undead, it's that bad. The upside is once they realise I'm not, we all get sloshed. If for no other reason, I like this book. Anyway again, moving on the a pirate from the first night of drinking ambushes me with some of his mates, I dispatch them easily and find they're loaded with gold too. For once, I'm thinking where the hell is Yaztromo? I could totally clean him out of stock right now. Skipping the abandoned quarry - I've already got the magic spear which has killed Mortis once - I crashed for the night, and woke up apparently with a hankering for more booze - so much that I'm apparently heading for an inn which is definitely not marked on the map on the inside cover of the book, in spite of what my character thinks. I get there somehow, and meet a merchant who sells me some body armour that reduces any damage I take by one point - meaning later on when I'm peppered with arrows by undead archers, it doesn't hurt. I'm feeling pretty damn invincible by now. I also meet a soldier called Kandogor, who tells me Braxis (oh yeah, Braxis is the dude who used to run Bloodrise Keep - oh yeah, Bloodrise Keep is where Mortis is holed up) is still alive. We decided to team up, and get a room together (no, this isn't where the romantic subplot begins). Pretty soon a woman enters the room - Kandogor almost kills her, but it turns out she's some kind of uber-Elf babe. The book describes her as having skin like moonlight, eyes like liquid emeralds, and so on. I think the author might have been up late, alone when he wrote this part of the book. It's perhaps the most Mills and Boon passage I've ever come across in a FF gamebook. Anyway, instead of getting hammered this night now there's some female company, we all crash out. The next day we're off hunting Lady Lotmora, a vampire holed up in the local cemetary. We dispatch her, stuff happens, and I'm soon at Bloodrise Keep. I wander on in, feeling pretty good about my chances, especially so when within minutes I'm at the Chapel of the White Queen. She teaches me a cool trick, which is the last I hear of it, and I move on. Wandering through the keep, I'm asked to test my alarm value a few times - which is odd, considering I've accrued but a single point of alarm, and the book is asking me to roll several dice and add amounts that are higher than my total. I've literally tip-toed my way through an evil army's headquarters, right to the Lich-Lord's door. On opening it, I threw the magic spear at him, and ta-dah, the book was over and I'd won. WTF? That was quite easy. I drank more ales than I ate meals, I didn't have to use the key I found or the magic 'Ring of Communication' once, and I didn't have spectacular rolls. On the plus side... wait, it's about time there was an easy FF book! That is the book's major plus, in a way. But it's also entertainingly written with nice attention to detail like overheard conversations and amusing graffiti ('Bloodfang rules OK!'). But on the downside, yeah, it was too easy. Fun though, and apparently there are several ways to win it, which I know adds to its ease but means you won't mind reading it again if you don't complete it first time through, which makes it a good recommendation. Aww! That's nice of you, posting for us! Been reading your archives for a few days, very entertaining. The quality of your starting rolls can make a difference to how easy the book is. I remember being killed by the pirate and his friends on my first attempt at this one, and another time I wound up mesmerised by Lotmora. My favorite FF book! Full of great sub plots that WANT to try! The only FF book I have ever completed on my first attempt! I still enjoyed the adventure though.